(Phys.org)—A small team of researchers from Italy, Norway and Austria has found evidence of an ancient extinct goose relative that once lived in what is now central Italy. In their paper published in Royal Society Open Science, the team describes the fossils they found, what they suggest the bird once looked like and possibly how it behaved. The fossils were found in the Gargano region near the town of Scontrone in central Italy, a place that prior research has shown was an island in the Mediterranean during the time that the bird was alive—approximately 6 to 9 million years ago. Its bones suggest it weighed approximately 22 kilograms and stood approximately one and a half meters tall. But its wings were perhaps too small to allow the bird to fly. The researchers suggest this is common in evolution, especially on islands where birds no longer rely on flight to escape predators. 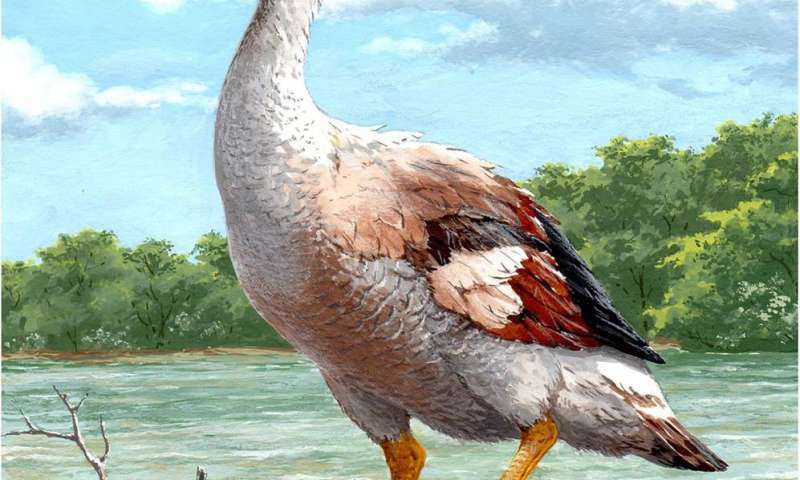 The large size, the researchers note, also suggests it was not an aquatic bird and perhaps lived in a forested area where it clearly had no problems finding enough food for itself and its offspring. Its wings also had carpal knobs (hard and rounded skin) on the carpometacarpus bone (the one on the end akin to the hand in humans)—they are used by modern birds to fight with one another. For that reason, the researchers suggest the ancient bird was likely a fighter, as well. They have dubbed it Garganornis ballmanni. Modern birds with carpal knobs also include some ducks and geese that commonly fight one another over territorial rights. There was also another bird, the Rodrigues solitaire, now extinct, which was known to fight so ferociously that pairs of them would break each other's bones. The researchers suggest that G. ballmanni likely fended off any attackers by virtue of its large size, but it would likely also have had to fight with others for another precious resource: fresh water. That would mean that it was likely aggressive as well, a trait not uncommon in modern geese. The fossils also represent the first bird remains to be found at the dig site at Scontrone. New skeletal elements of the recently described endemic giant anseriform Garganornis ballmanni Meijer, 2014 are presented, coming from the type-area of the Gargano and from Scontrone, southern and central Italy, respectively. The new remains represent the first bird remains found at Scontrone so far, and another shared element between these two localities, both part of the Apulia-Abruzzi Palaeobioprovince. The presence of a very reduced carpometacarpus confirms its flightlessness, only previously supposed on the basis of the very large size, while the morphologies of tarsometatarsus and posterior phalanges clearly indicate the adaptation of G. ballmanni to a terrestrial, non-aquatic, lifestyle. Its very large body size is similar to that observed in different, heavily modified, insular waterfowl and has been normally interpreted as the response to the absence of terrestrial predators and a protection from the aerial ones. The presence of a carpal knob in the proximal carpometacarpus also indicates a fighting behaviour for this large terrestrial bird species.